The holidays are right around the corner, and so are seasonal specials and a new winter menu at Seasons 52. The restaurant's core menu changes four times a year with every season, and all the features on the right hand panel of the menu change every week, 52 times a year. The menu showcases over 100 different bottles of wine, 52 of which are available by the glass. 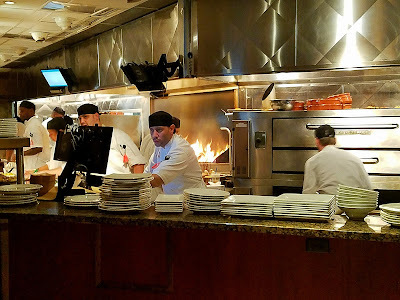 Seasons 52, in case you are not familiar with the brand, is a fresh grill and wine bar that offers a seasonal menu inspired by the fresh appeal of a farmer’s market and what’s good now. They gather ingredients from all over the world and use them at their peak with rustic cooking techniques. The kitchen is open and you can see oven roasting and open fire grilling over oak and mesquite, which bring out the natural flavors of food. The Winter Menu launched on November 15th. Seasons 52’s winter menu features seasonal fare such as the new Portuguese Kale & Chorizo Soup, Braised Short Rib Flatbread and the Artisan Grilled Vegetable Sandwich. Seafood entrees coming into season include Nantucket Bay Scallops, Wood Grilled Tuna and Stone Crabs. Of course wine is always being added, but for the winter menu a few new cocktails have arrived as well. The wrap around bar at the Sand Lake location of Seasons 52 has plenty of seats to view the gorgeous display of wines and spirits from all over the world. Speaking of Spirits, two new drinks for the winter are the Cranberry & Sage cocktail with Prairie Organic Gin on the left and an Organic Sunshine Martini with Prairie Organic Vodka on the right. Prairie Organic makes Gin and Vodka that is certified organic by the USDA and kosher by the Orthodox Union, and they are also green and clean. Very good drinks, and the Prairie Organic spirits are some of the best I’ve had with a clean and smooth taste. A wonderful amuse bouche with smoked apple and pork belly compliments of the chef. The Duck Wing Lollipops are simply amazing. These things are covered in a Korean Gochujang red chili glaze and just fall off the bone. They do have a tad bit of heat, so do be careful...but they are worth it. On a slightly cool night, the Portuguese Kale & Chorizo soup is the perfect thing to warm you up. A savory soup that was light, but satisfying. The new seasonal flatbread on the menu is the Braised Short Rib and Aged Cheddar Flatbread. This is a must try item. Full of flavor with a light and crispy texture. A perfect flatbread to share with some friends over a good glass of Cabernet Sauvignon. The Asian Glazed Chilean Sea Bass is by far, one of the best sea bass dishes I have had in quite some time. The fish was so flaky and tender, it just dissolved in your mouth. The sea bass sat on top of a black rice cake and was served with snow peas, shiitake mushrooms, and micro wasabi. The Mediterranean Braised Lamb Shank not only looks awesome...it tastes awesome too. The meat just falls off the bone and the accoutrements of Yukon mashed potatoes and vegetables make it a great savory down home meal. Dessert shooters are a great way to end the night, especially when you just want a little something sweet to eat. The pecan pie shooter on the far right was outstanding. These come in a wide variety of flavors, so there is something for everybody. With Thanksgiving right around the corner, Seasons 52 will be open for the holiday and is proud to offer Plainville Farms turkey, never, ever given antibiotics, served alongside the chef’s take on the usual trimmings and seasonal cocktails. For Black Friday, the restaurant will also be offering All Day Black Friday specials for guests looking to shop ‘til they drop on November 25th. Along with seasonal cocktails and intimate private dining options for family events or holiday parties, guests can purchase Seasons 52 gift cards for foodie friends and relatives. If you purchase $300 or more, you will receive a signature 7” Japanese Santoku knife from Mercer Cutlery. The knife has the Seasons 52 logo etched on both the blade and on the sleeve. The weather is finally a few notches below sweltering in Orlando which means Floridians are soaking up as much outdoor time as possible. The days and nights to enjoy a crisp autumn breeze are few and far between here in sunburn city, so everyone is embracing the seasonal change like a long lost friend. Enthusiastic locals are breaking out their Ugg boots and plaid scarves to welcome the slight wind chill. Thankfully, Orlando is blessed with a bevy of unique restaurants that offer "al fresco" dining experiences for patrons to continue reveling in the cooler temperatures. 1. Baoery Asian Gastropub – The outdoor patio features sleek umbrellas for comfortable shaded seating in a casual and contemporary atmosphere at Baoery Asian Gastropub. Strings of mini lantern lights adorn a red awning over a row of picture perfect picnic tables. Indulge in one of their signature baos or bowls of ramen while sipping on a cocktail during the lively buzz of happy hour for a spirited night out on the town this season. 2. Soco – Outdoor seating is available at Soco under a sea of striped umbrellas that make up their bistro-style terrace. Whether you’re in the market for an elegant evening meal or an upscale Sunday brunch, glasses of red wine and flutes of mimosas pair perfectly with the southern charm and inviting ambiance only found in Soco’s open air dining space. 3. Morimoto Asia. - The modern two story outdoor veranda offers seating both upstairs and downstairs for guests. Dinner under the stars is a must on the balcony at Disney Springs’ Morimoto Asia. The stunning venue is especially a sight to behold at night when the Japanese script on the restaurant’s glass front entrance is brilliantly illuminated. Feast on spicy salmon sushi rolls or chicken dumplings and treat yourself to a drink from Morimoto's specialty fall cocktail menu while savoring the cool night. 4. STK - The best way to unwind during this holiday season is with the Poisoned Apple mixed drink off of STK’s decadent seasonal cocktail menu while lounging on their rooftop deck overlooking the bustling crowds of Disney Springs. Stay for a full filet dinner or just pop in for appetizers and a night cap while basking in the fleeting fall breeze. Curl up by the roaring fire pit and sway to the beat of your favorite song crooning through the speakers. 5. Tutto Italia – Luxuriate in the fine al fresco dining at Epcot’s Tutto Italia on their intimate outdoor shaded patio for a romantic candle-lit dinner for two or for a gourmet lunch with friends. With a view of the Italy pavilion’s central piazza, guests have both a front row seat to the daily flag shows and a fabulous escape from the crowds for a relaxing meal. Since we are getting closer to Christmas, here is a good gift idea to any aspiring chefs at your house. Functional kitchen tool searches can seem endless. Consumers are looking for reliable, long lasting options every day. With the AnySharp Metal Pro Sharpener, the search for the world's top rated knife sharpener, is over. For home and professional cooks everywhere, AnySharp Pro turns a dull knife, even one with a serrated edge, into a razor-sharp cutting instrument in mere seconds with just a few light strokes. Less-than-sharp blades are major contributors to cuts during meal preparation, AnySharp Pro eliminates that danger by getting the sharpest results by securely attaching to a smooth surface or worktop with a PowerGrip suction base. Knives can be sharpened hands free. Here the sharpener is securely attached to my counter with its secure suction grip. The AnySharp Works with all your knives, even serrated blades. The unique, patented AnySharp Knife Sharpener uses tungsten carbide technology to extend the life of almost any knife. AnySharp works on virtually any steel knife, including expensive hardened steel knives and even serrated blades (like bread knives and hunting knives), making it unlike any knife sharpener, sharpening steel or sharpening stone you’ve ever used. Very simple to use with great results in half the time of a traditional sharpener. Available for purchase at Amazon USA and various retailers throughout the US. Go to http://www.anysharp.com/products/worlds-best-knife-sharpener/ for a full listing. The holiday season is all about life’s simple pleasures. Quality time with family, traditional eats and a spot on a white sandy beach make for an unforgettable Thanksgiving holiday. Travelers and local Floridians can experience the sea and discover the charm at Fort Lauderdale Marriott Pompano Beach Resort & Spa with a bountiful Thanksgiving Dinner and a holiday getaway package with all of the comforts of home. This year, Thanksgiving is by the beach. On Nov. 24, families will gather in the resort’s Grand Bahama Ballroom for a Thanksgiving feast prepared by Executive Chef Eric Kaszubinski. Featuring traditional holiday favorites and live entertainment. Dinner will be served buffet-style from 12-6 p.m. with seating times available at 12 p.m., 2 p.m. and 4 p.m. Menu selections include Chef-Carved Herb Roasted Turkey With Pan Gravy and Cranberry Relish; Chef-Carved Bourbon Glazed Spiral Ham With Pineapple and Tart Cherry Sauce; Butternut Squash Bisque; Cider Brined Pork Tenderloin With Fig & Onion Compote; Atlantic Salmon With Lemon Herb Butter; and Sweet Potato Soufflé With Pecan Crumble. Dessert selections will include Pumpkin Cheesecake; Maple Pecan Tarts; Apple Cider Crumb Tarts; and Chocolate Pot de Crème. Thanksgiving dinner is priced at $52 for adults and $18 for children ages six to 12. Reservations are required. The Home Away From Home for the Holidays package includes overnight accommodations for four (based on a two-night minimum stay), daily buffet breakfast at McCoy’s Oceanfront, a special delivery of a gingerbread house kit for in room family fun, Kids Club access for one half day for up to two children, a 15 percent discount on all regular priced treatments at SiSpa, and a Shopper’s Savings Book courtesy of The Galleria Mall in Fort Lauderdale. Rates start at $229 per night. For more information on Fort Lauderdale Marriott Pompano Beach Resort & Spa, please visit www.pompanomarriott.com or call 855-954-4683.